Colombia. Ca. 300 to 500 AD. This zoomorphic transformation figure is a fine casting with multiple levels of iconography and symbolism. The main figure has human and feline features in transforming with fanged mouth and elaborate headdress. Birds and other animal devices seem to be present at different levels as the piece is turned. It is thought that this figure would have been used as part of an animistic belief system in which the wearer would be imbued with the unique strengths qualities affiliated with the animals represented by this intriguing chimeric figure. There is a Tolima gold pendant with zoomorphic features of a different compositional style, but made within the same conceptual context, currently on view at the Metropolitan Museum of Art in New York on view in gallery 357. Pre-Colombian people were concerned with social status, and the function of adornments was to indicate wealth and position in society. Rulers wore gold crowns and were buried in gold masks. Priests used gold utensils and dressed in clothing laced with gold. The elite class adorned themselves in gold and silver ornamentation that could be seen at a distance, displaying their status through opulence, asserting their divine authority to make the transformation to the next world when their time came. The technical mastery involved to produce such sophisticated gold artifacts is marvelous and worthy of deep investigation. 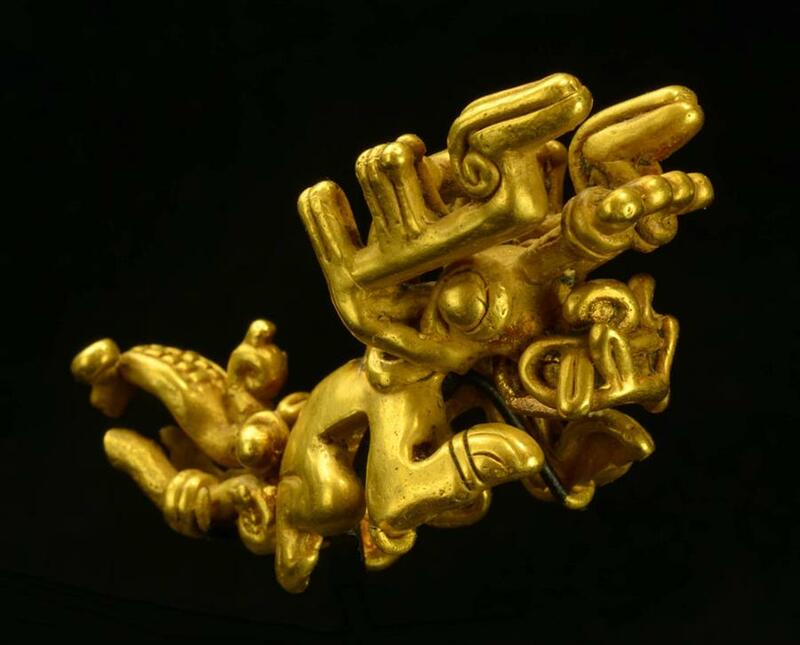 In fact, the ancient Pre-Colombian master craftsmen were as skilled at lost wax casting, hammering, repoussé work, depletion gilding and incising as any of the other cultures in Europe at the time. The timelessness, beauty and ingenuity of these objects is as evident and relevant today as it was in ancient times. Size 3-1/2 inches L. + custom presentation mount. Ex JH Poway CA Collector. An impressive 99 grams in weight. A fabulous work of art. Ex V. Cano Sr. Ex Poway CA private Coll. J.H.